This little website is all about pantheism, the doctrine that identifies God with the Universe. "We followers of Spinoza see our God in the wonderful order and lawfulness of all that exists and in its soul (beseeltheit) as it reveals itself in man and animal." From a letter to Eduard Büsching (25 October 1929) after Büsching sent Einstein a copy of his book Es Gibt Keinen Gott (There Is no God). Einstein responded that the book only dealt with the concept of a personal God. 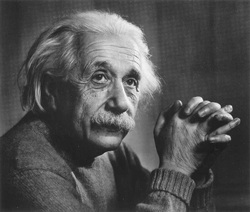 Einstein usually identified himself as agnostic, but admitted a belief in pantheism. The term pantheism is constructed from the Greek pan "all" and theos "god" and is described as "the belief that every existing entity is, only one Being; and that all other forms of reality are either modes (or appearances) of it or identical with it.” Stanford Encyclopedia of Philosophy. "Not only is pantheism not antithetical to religion, but certain religions are better understood as pantheistic rather than theistic when their doctrines are examined. Philosophical Taoism is the most pantheistic, but Advaita Vedanta, certain forms of Buddhism and some mystical strands in monotheistic traditions are also pantheistic. But even apart from any religious tradition many people profess pantheistic beliefs—though somewhat obscurely. Pantheism remains a much neglected topic of inquiry. Given their prevalence, non-theistic notions of deity have not received the kind of careful philosophical attention they deserve. Certainly the central claims of pantheism are prima facie no more “fantastic” than the central claims of theism—and probably a great deal less so." Stanford Encyclopedia of Philosophy. Belief in pantheism is often founded on a mystical experience of oneness with nature. Arne Naess, an influential Norwegian philosopher, who champions nature for nature's sake, once spoke of a compelling emotional experience many people have in nature of being connected to something greater than themselves. Aldous Huxley called mystical oneness with nature "the perennial philosophy". Christianity's greatest mystic, Meister Eckhart, spoke of the sublime moment when "all blades of grass, wood, and stone, all things are One." It is this sublime experience of unity with the infinite All that pantheists call God. Charlene Spretnak described pantheism as "the sacred moments in life when we experience in rational and very direct ways that separation, the boundary between ourselves and other people and between ourselves and Nature, is illusion. Oneness is reality." "I believe in the cosmos. All of us are linked to the cosmos. So nature is my god. To me, nature is sacred. Trees are my temples and forests are my cathedrals. Being at one with nature." Mikhail Gorbachev. "God does not die on that day when we cease to believe in a personal deity, but we die when our lives cease to be illuminated by the steady radiance, renewed daily, of a wonder, the source of which is beyond all reasoning.... When the sense of the earth unites with the sense of one's body, one becomes earth of the earth, a plant among plants, an animal born from the soil and fertilizing it. In this union, the body is confirmed in its pantheism." Dag Hammarskjöld, Markings. "I believe that the universe is one being, all its parts are different expressions of the same energy, and they are all in communication with each other, therefore parts of one organic whole. (This is physics, I believe, as well as religion.) The parts change and pass, or die, people and races and rocks and stars; none of them seems to me important it itself, but only the whole. The whole is in all its parts so beautiful, and is felt by me to be so intensely in earnest, that I am compelled to love it, and to think of it as divine. It seems to me that this whole alone is worthy of the deeper sort of love; and that there is peace, freedom, I might say a kind of salvation, in turning one's affections outward toward this one God, rather than inwards on one's self, or on humanity, or on human imaginations and abstractions - the world of the spirits." Robinson Jeffers, 1934. "A human being is part of the whole called by us universe ... We experience ourselves, our thoughts and feelings as something separate from the rest. A kind of optical delusion of consciousness. This delusion is a kind of prison for us, restricting us to our personal desires and to affection for a few persons nearest to us. Our task must be to free ourselves from the prison by widening our circle of compassion to embrace all living creatures and the whole of nature in its beauty. The true value of a human being is determined by the measure and the sense in which they have obtained liberation from the self. We shall require a substantially new manner of thinking if humanity is to survive." Albert Einstein. This website was created by Annika Garratt © 2012.